There is a certain fascination for having a world record even when it comes to museums and collections. The largest body of work signed by a certain artist, the most valuable paintings, the oldest building, the richest treasures brought together in a single space, and the list could go on. But there are some who are interested mainly in rather bizzare achievements. Such as having in your home town the single smallest museum in the world, and to make it official by including it in the prestigious Guiness Book of World Records. 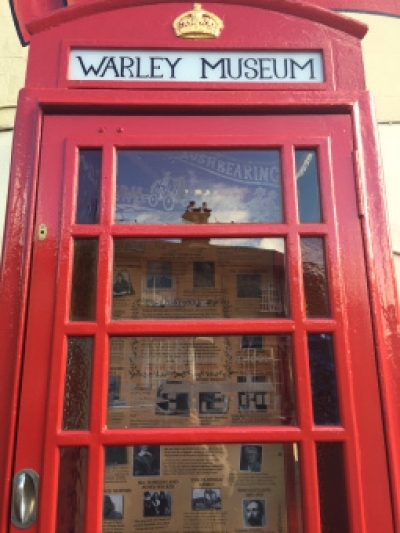 The Warley Museum in the place with the same name - near Halifax, UK - is that kind of a museum, as it could fit inside a traditional phone box. You know the kind, those old, red and massive ones, those that are still so "British", despite the fact that they have become more of a thing of nostalgia then that of practical use, as everybody seems to have a mobile phone. And the Warley Museum is really hosted inside such a phone box. No more, no less, large enough to present the exhibits and small enough to allow only one visitor at a time. The rest will have to wait their turn. And it wasn't just an advertising gimmick, but on October the 8th 2016 this unusual museum was opened by the mayor, several other officials, the locals and, of course, the press. Which provided the best campaign for the new cultural institution which was awaiting it's visitors in Warley. From the very beginning the smallest museum in the world - as the locals proudly say - was thought as being a small lesson of the town's history and cultural identity, so the permanent exhibit contains photographs and documents, personal items and small keepsakes, memorabilia and medals, all managing to build an interesting, diverse and pleasant story. All in a phone box. Which was of course restored, repainted and carefully prepared for the event. The Warley Museum is still opened and still welcoming it's visitors. And while it might not have been the huge increase in tourists that some might have hoped for, it is an original, funny and nostalgic landmark that you must not miss if you ever come here.